Rain Rain Come Again Another Day, Little Johny Wants to Reach Home Today! Well, that’s what many people seem to be reciting during this year’s monsoon. 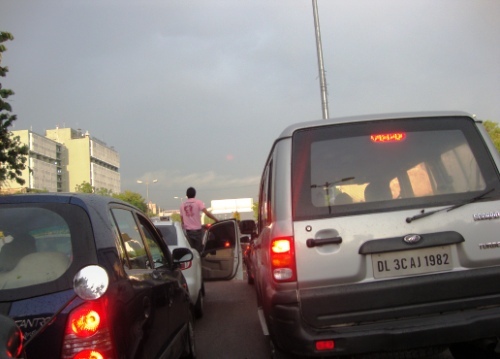 The reason for such a wish being the menace caused by rainfall that leads to traffic havoc and raises people’s irritation level even as it brings down the city’s mercury level. Since the announcement of our new campaign “Delhi Monsoon 2010”, the graph of excitement and anticipation for this year’s monsoon has been going up and down…down and up. The scanning of news on monsoon and how the city is interacting with the hide and seek game of the monsoon has brought out some interesting facts to study and discuss. The long-awaited monsoon reached the capital on July 5, Monday after a six-day delay. According to B.P. Yadav, Director of the India Meteorological Department, “even though the city missed its usual monsoon date of June 29, the rainfall for this season will be good.” But the news that flashed across many newspapers in the days that have followed and people’s reaction has varied as to what “good” is expected from the monsoon. By 7th July news sources across the Internet flashed how Monsoon had knocked out Delhi and Haryana. Heavy rains and windy conditions disrupted operations at the IGI airport for about half an hour. Classic cases of civic negligence came forward with large sections of the busy Aurobindo Marg connecting Central Delhi with Gurgaon and South Delhi caved in after an evening of downpour. The result, both sides of the main road had to be blocked for traffic all the way from AIIMS to IIT-D, leading to massive jams on all the roads in the area. A reputed media agency revealed this to be the result of covering up of a storm-water drain at Gautam Nagar by the Municipal Corporation of Delhi (MCD) last year. Problems after problems have been running through most of the news channels on monsoon 2010. Yesterday’s sad news of lives being lost only added to the unfortunate and dismal situation, that is now the monsoon menace in the capital. It is reported that three persons, including a woman, were killed in rain-related incidents as heavy showers lashed the capital in the evening. A woman died due to wall collapse and two men were electrocuted when they came in contact with an electric wire which fell off a pole due to the rains in Chandni Chowk. In yet another incident, a three floored building came down killing the entire family which resided in it. Few good news were reported related to the monsoon. One being the most common declaration of respite from the killer heat of Delhi. The rest, or if any of it exists, is hardly discussed or talked about. Why the monsoon, for all its blessings, never gets due respect and appreciation skips many a minds just like the rain clouds that skip Delhi so often. Do we ever wonder where all our drinking water is coming from, why we need rain, and the importance of such short lived season as the monsoon in Delhi? The Delhi government has asked residents of low-lying areas along the Yamuna river bank to remain alert and if possible shift to safer places. 50, 000 cusecs of water may be released from the neighbouring Haryana state as it has been witnessing incessant rains since the past two days. Remembering the Yamuna that has been nothing more but a drain, and for which a cleansing solution is so sought after, a flood on it sounds a bit unimaginable. A natural process of cleaning or rather the natural way a river should be, will be a good eye opening picture for many people in and around Delhi. Relating the problems to its causes and analyzing the impacts will definitely bring to light many neglected issues that need simple yet urgent solutions in the city. Prevention is always better than cure. This phrase has stood true through all time, and our city planners and authorities need to integrate this wise saying in all developmental planning and throughout the implementation phase. The coming days will bring respite from the heat but are we missing out on the larger picture of such short relief.